This article was published when the price for one bitcoin was $361.83 or €286.28 on bitcoinaverage. Have you been thinking, “What should I do with all of my bitcoin?” or “I am sick of living in my country. What are my options?” I’ve contacted a few folks listing their million dollar properties on BitPremier and compiled this list. I’ve traveled to this area in 2006 and visited Whidbey Island for a wine tasting at Pasek Cellars. Island life is much slower paced than what goes on in Seattle, which is the closest city to the east of the Orcas. The real estate agent got back to me with this information. “My client/the owner of the house is the mother and stepfather of Danny Johnson. Danny is a professional poker player who lives in Hawaii full time. Danny is part of a group who started an altcoin called Pinkcoin. The family built the home themselves. 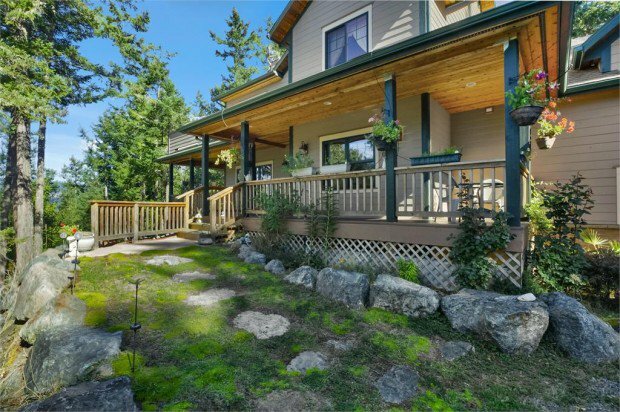 The property is located on Orcas Island in the San Juan islands of Washington accessible by boat or ferry from Seattle. The best way to catch the upcoming Bit Drop would be in a front row seat from this 19 acre estate in Dominca. I contacted the seller and he offered this information. “As you know, Dominica is home to the Bit Drop event that will occur in March 2015. Big party! The country is btc friendly! I lived and fished in the Caribbean for years (25 plus from the Out Islands in the Bahamas, Cuba, Dominican Republic to Aruba) and discovered Dominica … the last “unruined” island in the Caribbean. My decision to purchase was simple … I fell in love with the island and its people … the island is laid back, English speaking, plenty of water, abundance of fresh fruits and vegetables … fresh fish every day, etc. Mountains where you can drive up in to the clouds and cool off, and get “cold,” a steady breeze and nice folks … only 60,000 of them on a huge island. Also the island with the last remaining Carib Indian population. Dominica is an ex-British Crown Colony that gained independence in 1978. The atmosphere of the locals is proud, free and laid back. The property I am selling has a view of the Atlantic Ocean and the Caribbean. Above a marine reserve … you can see whales from the property. The Huffington Post and the London Times have voted Dominica the number one whale watching spot in the world as you can view them year round. The bay that you see below the property goes halfway to China…that’s why the whales go there. Very deep. The number 1 dive and snorkeling spot in the world and Caribbean as voted by the magazines is just to the north of my property…a short swim away. The property used to grow all the limes for Rose’s Lime Juice Company from the UK. There are still some of the pulley machines from the early 1900’s on the site. The entire island is so fertile, one could throw a beer can on the ground and a brewery would grow there in a week. No one is hungry on the island. From avocados to the sweetest tomatoes you would ever taste, anything can be grown…in the mountains, coffee and marijuana…yes, one or two Rastas there…my old chef and family were Ratsas. Peace and love. And a spliff. The property is self-sustaining from an energy perspective…solar (the Caribbean) and since it is a few hundred feet above the sea…a great breeze year round. The property is slightly terraced, has many trees and greenage, and one could put a rappel site at the southern end as well as a shooting range. Some of the trees…provide bois bande, nature’s Viagra. Although they have cable going right into the island, the business server internet craze hasn’t established a presence there. The “pipe” enters the island a few miles from my property. I flew (twice) in the team that wifi’d Seattle to ensure that I could get Japan Standard at the property. They confirmed it. Perhaps more importantly, I am offering 2 “investor citizenship packages” with this sale for the purchaser and his wife, partner, friend or whomever the buyer selects. These are lifetime citizenships that are irrevocable and allow the issuance of 10 year, renewable passports for those newly appointed citizens. Of course, the buyer needs to pass a due diligence for the citizenship option. I will offer terms with 25% down. On another note, if a buyer purchases before 31dec14, I offer a price of $1.7 mil. More importantly, the land is owned by a corporation and the shares may be transferred to the buyer or the buyer’s designated agent. Anonymity if desired. The real estate agent hasn’t responded to my inquiry, but this is a snippet of the description from the listing. The agent didn’t get back to me, but here is a sample of the description. For those of you who plan on sliding down mountains when it snows this winter, you may want to skip your typical season pass and opt in for this chalet — I love saying the word chalet (SHaˈlā) — on the French Alps. I’m still waiting to hear from the real estate agent, but I’ve included a part of the description. “Situated midway between the picturesque alpine towns of Tignes & Val-d’Isère. If you happen to do your homework and end up getting one of these properties, please return the favor by inviting me to your house warming party. Make sure to update coinmap with your listing if you turn your property purchase into a hotel or rental. Notes: When you visit these properties you have the opportunity to request more information anonymously. The form says the bid price is optional, but erroneously will not send any messages without a price.